How many times have you been in a situation where you have to decide how serious your condition is and if you can afford to call the ambulance? It’s Saturday afternoon, you take a phone call from your employee’s wife, who tells you they are in the county hospital. Her husband, you employee, was just flown from their weekend camping spot, because he went head over the handle bars of his mountain bike and broke his collar bone, also the medical first responders were sure he had suffered a concussion. Her next question leaves you scratching your head and telling her you do know…..but she needs to check with your HR person. “Will his health insurance cover the costs of the air ambulance to the county hospital?” You’re not sure but you think it will. Does My Group Health Insurance Cover My Medical Transportation Costs? If an EMT crew or a Medical doctor decides you’re in need of Emergency Medical Transportation they are going to order it and you are going to get either an air ambulance ride or transportation in an ambulance to the nearest hospital. No one will ask the question does his or her health insurance cover the expense of the transport. EMT’s and Doctors are in the business of saving your life not insurance. The answer to the question is yes most health insurance companies provide some but none of them cover the entire costs of transporting you to a hospital via air or ground. This service can run you anywhere from $5,000 to $75,000 or even more if you are out of the country. The typical health insurer may cover up to 30% of the bill. Leaving you and your loved ones having to come up with the money to pay the balance owed to the air or ground ambulance company. Ouch! Independent Emergency Transportation Companies have exploded in the last 10 years. 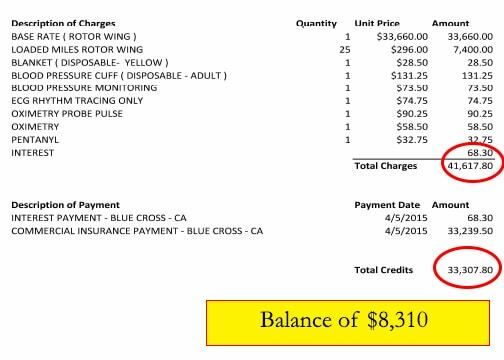 Because air-ambulance companies enjoy favorable treatment under federal law, they can charge what they want for their services. Needless to say the consumer is often left holding the balance bill after their insurer the stated amount in your health insurance contract. If you don’t know what that amount is you should find out. What About The Air Ambulance Transportation Memberships? Many emergency medical transportation companies sell annual memberships that will pay for your transport to the nearest hospital if you need it. Which is great if you happen to be in their coverage area and you are picked up by the company you bought the membership through. Ahhh, that’s the catch. You may not be in their coverage area and since the emergency medical companies often have contracted coverage area. Also you could be picked up a different company then the one you are contracted with because normally the emergency transportation companies are called out using the round robin or next up dispatch method. As a small business owner living in Central Oregon my employees and family know friends and family that have been air lifted to the nearest hospital and have indeed received the balance bill for thousands of dollars. We also bought the membership programs from three different emergency transportation carriers just so we could make sure we covered if the “what if” happened. It always We can supply you with a membership that acts as your safety blanket for any type of transportation – whether it be ground or air ambulances. And it is the only one you will need– instead of having two or three air ambulance subscriptions to be safe. It always annoyed me I was forced to buy 3 memberships and none of them not one would cover me for all 50 states in the US. Finally there is a solution MASA a medical transportation company the sells a membership that will cover you and your employees in all 50 states. You will be covered no matter which emergency medical company picks you up. Gone are the days of buying multiple memberships. Bancorp Insurance offers MASA’s medical emergency transportation to employers groups. All employer groups are eligible. I know my employees were relieved and happy that not only were they covered if they needed this important service but their family members were also covered. Give your employees that peace of mind, if they or a loved one is air lifted to the nearest hospital they will not be left with a huge bill for the service. If you would like more information about MASA please call our office and ask for Valerie 800-452-6826 or email her directly Valerie@bancorpinsurance.com. Give us a call today at 1-800-452-6826 and let us discuss the options you have.